With a multitude of flavors from classic chocolate to floral rose petal, there is a favorite flavor for every single person. Each macaron will lead you in an adventure of tastes and texture. 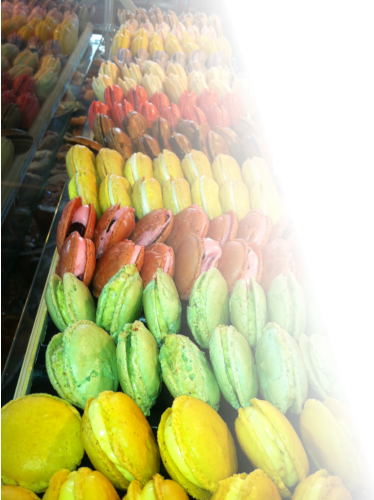 Much of the excitement is to discover which macaron you enjoy most! We have offered the following flavors so far: Chocolate Vanilla Cappuccino Mocha Caramel Salted Caramel Pear Banana Apricot Blueberry Raspberry Black Currant Passion Fruit Irish Cream Cherry Kirschwasser Cranberry Fleur d’Orange Amaretto Champagne Coconut Cognac Grand Marnier Pistachio Hazelnut Tiramisu Lemon Rose Petal Lavender Check one of our cafes for available flavors. Discover Jean Yves' passion for perfection in his full line of delightful Macaron flavors.